He also has a nice book on American monuments Lies across America: what our historical sites get wrong. Gwen Sharp is working out some recent work on whiteness and geographical markers in Sociological images. Here is the discussion of historical markers that identify whiteness. So what story about our nation do these two monuments tell? 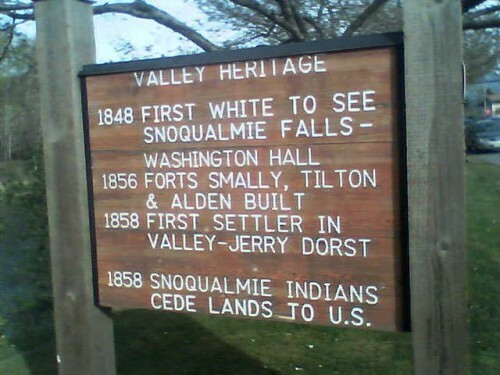 The only information contained on the two-sided Fall City monument refers to the activities of Whites; the Native residents were important only when they lost land. For all intents and purposes, the history of the area started only once a White man had set eyes on it. Similarly, Tallent’s arrival in the Black Hills is memorable largely because she was a White woman, whose presence is by definition worthy of note and celebration — imagine, a vulnerable White woman braving the wildness of the Dakota territory! The fact that she was an illegal prospector camping on land she didn’t own while in the pursuit of quick wealth is neither worth mentioning nor a cause to question whether she’s a laudable figure deserving of a monument. Thus, the effect of both of these monuments is to normalize colonization and illegal settlement, and present the arrival of Whites as the beginning of meaningful history. via Whose History Do Monuments Tell? » Sociological Images.